Queen's Park in New Westminster has always had their own butcher shop for more than 50 years. When we heard that Peter was closing the shop in June 2016 we decided to continue the tradition and re-open the butcher shop. We have done extensive renovations as per today's requirements and finally on September 13, 2016 we opened our doors. 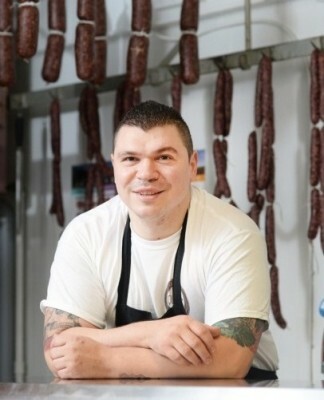 Florin the owner and butcher, has been a chef all his life. He has worked in various restaurants in Canada and Michelin Star restaurants in Europe where he has learned the art of aging, curing and processing various types of meats. He has always been facinated by processing, curing and smoking meats. From the desire to eat a good salami and a good cut of meat came the idea to open a butcher and deli shop.